Click here to visit our home page or click on any of the links in the menu bar above to see photos, menus and more. We are a waterfront, sunset view restaurant and bar featuring fresh seasonal local seafood and produce along with hand-cut steaks, sandwiches and more. Located on beautiful Dataw Island, we're only about 15 minutes from Downtown Beaufort and very convenient to Hunting Island, Harbor Island and Fripp! A special offer for HOMES TOUR GUESTS! JOIN US FOR DINNER ANY NIGHT NOW THROUGH NOVEMBER AND RECEIVE 10% OFF WHEN YOU SHOW YOUR SERVER THIS PAGE. Must present a printed copy of this page or show us this page on your smartphone in order to redeem this offer. One offer per check. Friday's we stay open until 10!! We are closed on Wednesday's but please make sure to stay tuned in for special openings on Wednesday nights! 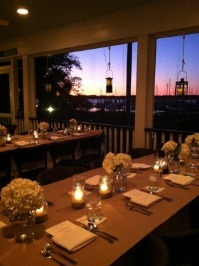 Call 843-838-2151 for reservations (they are not required, but are recommended). View us on google maps here.